A TV show just made me cry. An episode of Haven pushed it home about all the things that make the “commercial” Christmas important to us all. The true Christmas is about the birth of Christ but, let’s be real, it’s the Christmas spirit that is most important at this time of the year and that is truly commercial and now, universal. Yesterday, Shauna and I drove all over donating and shopping and because of us, some child will get a little stuffed dog that talks to them. Some women will get new jackets, socks and underwear. And those near and dear to us will get presents that mean almost as much to them as they do to us. Schedules are frelled up and Christmas Eve, morning and night will be filled with visiting, love and giving. Tomorrow will be the first Christmas dinner I will be able to eat in three years. Last year I was in the Vic General on Christmas Eve with a tube up my nose and in my stomach (not traditional with egg nog, which I was not allowed to have). 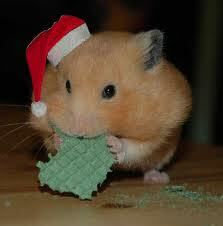 My kids visited (and I have a Christmas Hamster to prove it) then Norm spent hours with me until I sent him home. Alone. A hospital is a lonely place at the best of times but on Christmas Eve it was a Silent Night, indeed. The nurses were empathic and positive but when Christmas Morning came and Santa had not been to visit, I was devastated and then waited with fear that I would not be allowed to go home. I was, and Norm came and got me home in time to make Mimosas, coffee with “crema” and serve the miracle cinnamon buns that Shauna got at church. It’s tradition that I make cinnamon buns but I wasn’t there. Leanne was all prepared to make the Christmas dinner but I was there, and since no surgery was involved and in no pain, I helped, but all I was allowed was bland soft food. So, for the second year in a row, mashed potatoes (smidgeon) and gravy. I make very good gravy. The year before, I had a sleeve gastrectomy on the 5th of December and was also not allowed very much of very solid food. So, this brings me to my reason for the Christmas Eve rant. Things have passed and are in the past. So, love the ones near you and send good thoughts to all around you and wish peace on the world. Imagine if the world ceased to exist as we know it but turned into a world full of peace, love and sharing. ~ by 1fatgirlshrinking - Diane Kirby on December 24, 2011.